Due to popular demand, Wayne County Parks is offering bike riders a chance to bike through the lights before Lightfest opens to the public. This is an out and back event so all bike riders must be able to bike to the Warrendale picnic area and back (16K). 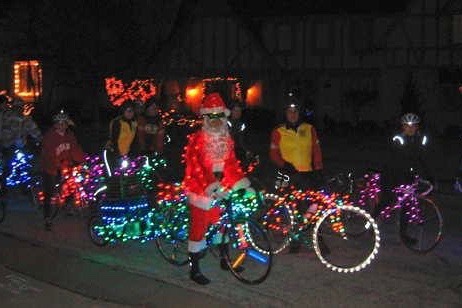 There will be a prize for the most decorated bike, so get out your holiday decorations for your bike! Start Area and Check-in: Location is Hines Park-Merriman Hollow Area which is the entrance to the Lightfest (Merriman Rd and Hines Drive, between Ann Arbor Trail and Warren Avenue in Westland, 2 1/2 miles south of I-96) Hines Drive will be closed to non-race traffic. Check in begins at 5:30pm and ends at 7:00pm. Includes long sleeve T-shirt (for the first 700 to register) and post race food.